Now that Thanksgiving is over, what are we going to do with all of these leftovers? Sure, it’s easy to take care of the bird. You can put turkey in anything that you would have normally used chicken: turkey pot pie, turkey noodle soup, white bean turkey chili… And of course, there’s the always popular turkey sandwich. But what about the rest of it? Let’s try to re-invent our side dishes over the next few days to keep our meals interesting and use up our Thanksgiving leftovers at the same time! Stir 1 egg in a large bowl to blend. Mix in the potatoes, then the flour. Using a generous 1/2 cup of potato mixture for each, form the potato mixture into 4 (4 1/2-inch) diameter pancakes. Heat the oil in a large nonstick fry pan over medium heat. Fry the pancakes until they are golden brown and heated through, about 2 minutes per side. Transfer the pancakes to paper towels to drain. Keep the pancakes warm on a baking sheet in the oven. Pour off the excess oil from the pan. Heat the pan over medium-low heat. Crack the remaining 4 eggs into the pan. Sprinkle with salt and pepper. Cook until the white is firm, about 2 minutes. Using a spatula, turn the eggs over and cook for 30 seconds longer. Spoon the sauce onto 4 plates. Place a pancake atop the marinara sauce. Top each pancake with a fried egg. Sprinkle with the Parmesan and serve. Preheat oven to 350. Place all ingredients into a large mixing bowl, using your hands to combine. Pack one half meat mixture into a loaf pan. Spread leftover Thanksgiving dressing over the meat mixture. Pack the other half of meat mixture on top of dressing. Top with ketchup- or your favorite meatloaf sauce and bake for 45 minutes to one hour. 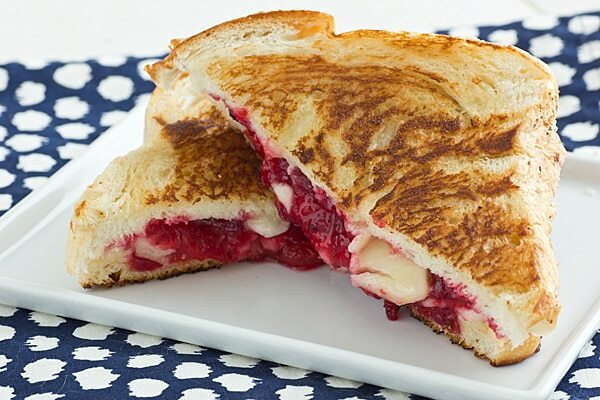 Put your leftover cranberry sauce on biscuits or in a smoothie at breakfast. 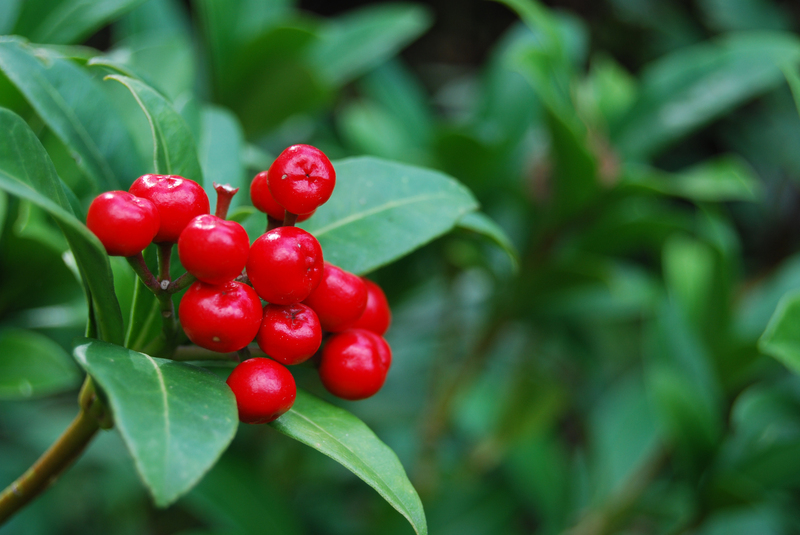 Use it as a fun ingredient in a grilled cheese sandwich, or on the iconic turkey sandwich. Mix it into your favorite muffins. Are you ready? If not: don’t stress. 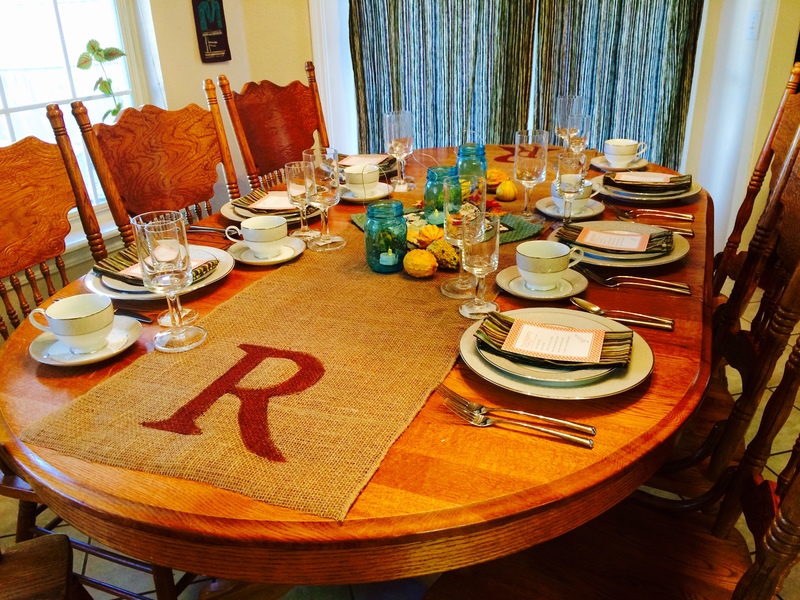 If you are hosting Thanksgiving dinner in your home but it is not perfectly clean: don’t stress. 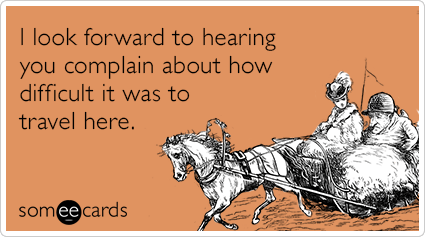 If you had a list of projects you wanted to finish before Thanksgiving but didn’t: don’t stress. If you wanted a beautifully, perfectly Pottery Barn-inspired decorated home but that didn’t exactly happen: don’t stress. Wouldn’t we all love for things to go perfectly all the time? But that rarely, if ever at all, happens. Take comfort in knowing that the loved ones you welcome into your home will not be there to evaluate the cleanliness with a white-gloved hand. They are not coming to judge your ability to decorate your table. They are coming to see you and the rest of your family/friends. They are coming to spend time with each other and with you. They are coming to enjoy a nice, warm meal and give thanks for the good things in their lives. Don’t stress. Don’t stress. Don’t stress. Take a deep breath, prioritize what truly needs to be done and do just those tasks. Then enjoy your holiday! Some quick tips though. Tonight, make a list of everything that needs to be done to get the meal on the table. Decide what can be done before you go to bed and get those things done now. This will make tomorrow that much easier. Have a wonderful and blessed day tomorrow and don’t forget to post a pic of your table or turkey on Instagram #jessicaskitchentable. There are so many different ways to cook a turkey, and it really isn’t difficult, but it is so intimidating the first time! The thing is to know what size you need, what size you have purchased, and timing. First thing’s first, how big a turkey do I need? For enough to have leftovers, a good rule of thumb is 1.5 pounds per adult and 1/2 pound per child. Chances are that you won’t be able to get a turkey exactly the size you need. For my own Thanksgiving dinner, I am expecting 8 adults and two children. By this rule of thumb, I would need a 13 pound turkey. I don’t think I’m going to find a turkey that small in a regular grocery store. My options would be to buy turkey pieces or to buy bigger and plan to have more leftovers to freeze. Once the turkey is purchased, it’s important to know how much it weighs because your thawing and cooking times vary by size. Do not roast a frozen turkey. Make sure it is thawed. The rule of thumb for thawing is one day per every 4 pounds. A 16 pound turkey will take 4 days in the refrigerator to thaw. That is a long time to have an entire turkey sitting and taking up space in the fridge. That’s why it’s important to plan ahead on this. How long should a turkey be cooked? That is dependent upon the size, cooking method, and cooking temperature. There are so many ways to cook a turkey, that I just can’t go into detail on every one of them. I am going to give you some basic numbers for oven-roasting the whole bird, because I think that’s still the most popular technique. ** NOTE: I do not stuff my turkey. I think the stuffing comes out too soggy, and it is difficult to get a proper read on the internal temperature. It is just asking for trouble as far as food safety is concerned. I like to roast my turkey, covered, at 275 for ten minutes per pound, then turn up the heat to 375 and slather the bird in butter and roast uncovered until the internal temperature is 170 degrees F. Once the bird is uncovered, I baste every 30 minutes. You could check your temp, with a meat thermometer, while basting . Butterball recommends that a turkey be roasted at 325 for about 20 minutes per pound, again until the internal temperature is between 165 and 170 degrees. What do I do to my turkey before roasting it? I really like to brine my turkey. I use Ree Drummond’s brine recipe. She makes note in her blog that frozen turkeys are already injected with a salt solution and should not be brined. Only brine a fresh turkey. Other people like to put lemons and herbs into the cavity of the turkey, which infuses it will flavor while it roasts. This makes for a beautiful presentation. Other options are a dry poultry rub or a glaze. Some turkeys and hams come with a glaze packet ready to go. 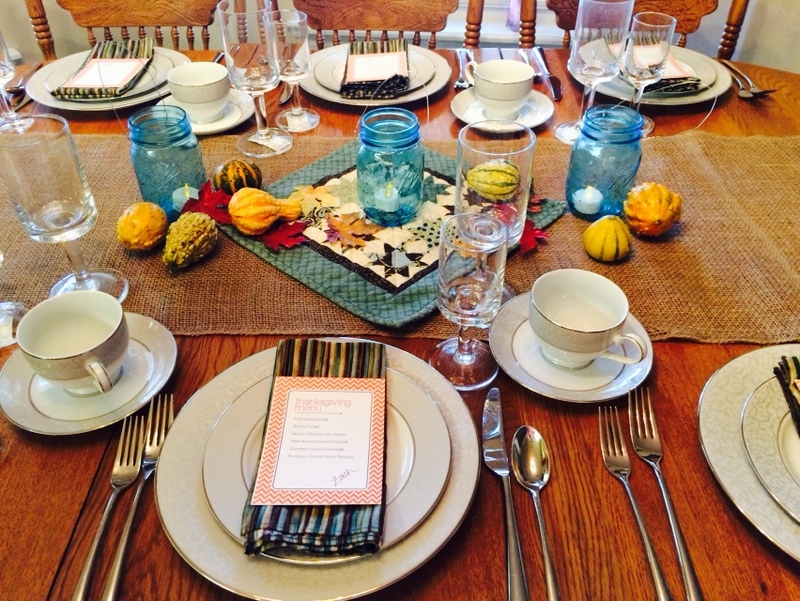 If you are not hosting Thanksgiving, but you are traveling somewhere for Thanksgiving, I have some tips for you!! If you are making a trip for the day, no big deal right? But it might be. Are you bringing food with you? If so, think hard about what you might bring. During this colder weather, I think it’s best to offer to bring something that does not need to be kept warm. It will be much easier to keep cold foods cold on a road trip than to keep hot foods hot. Bread, a nice salad, dessert or the cranberry sauce are all good travelers. Foods have a “danger zone” of temperatures. From 40 degrees F to 140 degrees F is the optimal temperature range for bacterial growth. Foods should sit at room temperature for no more than 2 hours. If food is going to be held for longer than 2 hours, it needs to be below 40 degrees or above 140 degrees for safety’s sake. The last thing we need around the holidays is food poisoning! The best way to keep foods cold on a road trip is to put them in an ice chest- with ice. There is really no convenient, easy way to keep hot foods hot in the car. If you really want to bring a warm dish, ask your host if there will be an opportunity to warm it up in the oven before dinner. If there will be time for that, you could bring your dish cold and put it in the oven when you get there. Travel Tickets- give the kids one “ticket” for each half hour of the trip. Take one from them on the half hour. When the tickets are gone, you’ll have reached your destination. Travel Scavenger hunt for preschool or older children. Whatever the age of your kids, hopefully these tips will help make your road trip more relaxing and pleasant. If you are staying overnight, you probably aren’t bringing food with you. If you are bringing food, the same food safety rules apply. Other than food, my biggest tip for overnight stays is this: PACK LIGHT! Chances are you will be staying in someone’s home. While we all love and enjoy having our closest family and friends stay with us, it often becomes overly crowded and that can add more stress to your hosts. The best way to combat this overcrowding is to bring as little with you as you can. Talk to your host beforehand and ask if it would be alright for you to borrow things like hair dryers, curling irons and other bathroom items that take up a lot of space. Also, try to bring only one or two pairs of shoes per person. I know this is difficult for some people (it definitely is for me!) but all of those shoes tend to get scattered around. They become a trip hazard. The whole point is to be a gracious and courteous guest when you are in the home of someone else. But I would offer the same tips even if you are staying in a hotel. It will make the trip easier on you in the long run. It seems that we always come home with more than we took. I don’t know if dirty clothes are bigger, but my suitcase is always a little more difficult to zip on the return trip! Do not go into detail about horrendous traffic, mid-trip car fights or any other negative talk about traveling to the home of a loved one. This will just make your host feel unappreciated and like you don’t really want to be there, spending Thanksgiving with them. I love pumpkin, but I’m not the biggest fan of pumpkin pie. I love coconut cream pie, chocolate coconut cream pie, and then I’m just about out of pies that I like. But I do love pumpkin! 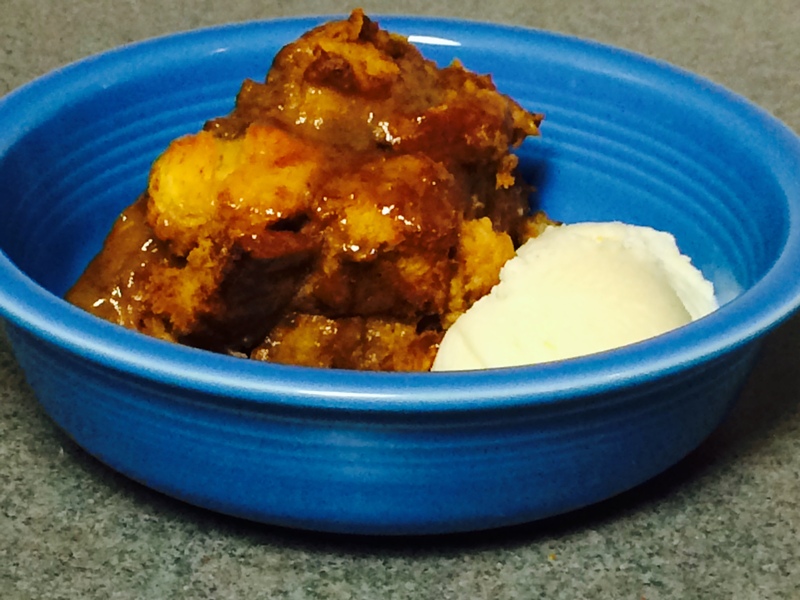 So this year for Thanksgiving, I’m going to make a non-traditional pumpkin dessert: Caramel Pumpkin Bread Pudding. I did a test run of it last week and it turned out great! When I did my practice bread pudding, I put half the recipe into my small casserole dish and the other half into an 8×8 in foil pan to take to a friend. For Thanksgiving, I think I’m going to bake it in a muffin tin so that we will have little individual portions. I will reduce the cooking time by quite a bit, but I’m not sure exactly how much, so I’ll let you know that later. First, I cut a loaf of challah bread into cubes (my husband baked the bread) but you could use an Italian bread from the bakery or grocery store. I put 3 eggs, one cup of milk and one cup of half n half in a very large mixing bowl and whisked it together. Then I added a 15 oz can of pumpkin puree and whisked some more. Next, I added in 2/3 cup brown sugar, 2/3 cup maple syrup, 1 tsp cinnamon, 1/4 tsp nutmeg, 1/4 tsp ginger, 1/4 tsp allspice, and 1/4 tsp ground cloves and I mixed well. Then I slowly and carefully folded my bread cubes into my egg/pumpkin mixture, making sure the bread is nicely coated in pumpkin. I baked this at 350 for 30 minutes. If you put the whole recipe into one dish, you would need to bake for 45 minutes. For the muffin tin approach that I plan to try later I will bake for 15 minutes and check it. I’m really not sure how long it’s going to take. I put 1/4 cup butter, 1/8 cup cream, and 1/2 cup brown sugar in a sauce pan and cooked over medium heat. The butter and sugar will melt and as it heats, it will turn that beautiful caramel color. Stir it often until it is thickened to your liking. Thanksgiving is my husbee’s favorite holiday. It always annoys him that stores seem to go from Halloween to Christmas without so much as a nod to Thanksgiving. I guess it’s just natural that our daughter has decided that it should be Christmas now, and doesn’t care much about Turkey Day. It’s because of my husband’s love of Thanksgiving that I am going all out this year. I have decided that we are going to use our nice wedding china because if not now, when? And with my Countdown to Thanksgiving, I am going to show my table to you. I looked at magazines and searched Pinterest to get ideas for table decor and I found some beautiful pictures. The thing is, I really don’t want to spend an arm and a leg plus come up with storage solutions for a bunch of new fall decorations. I am committed to putting together a nice table without spending any money… well, very little money. 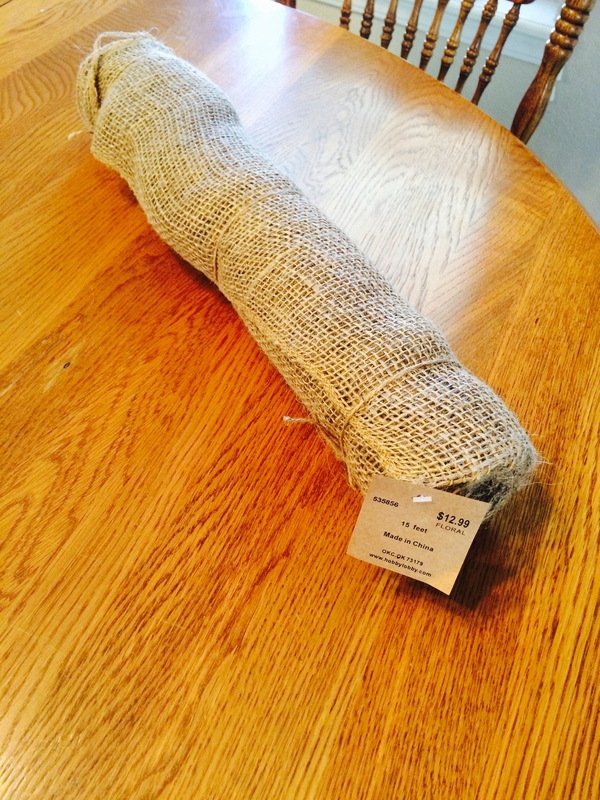 I got at it Hobby Lobby, but you could probably find burlap at any store that carries craft supplies. I used my 40% off coupon, so it was pretty inexpensive. 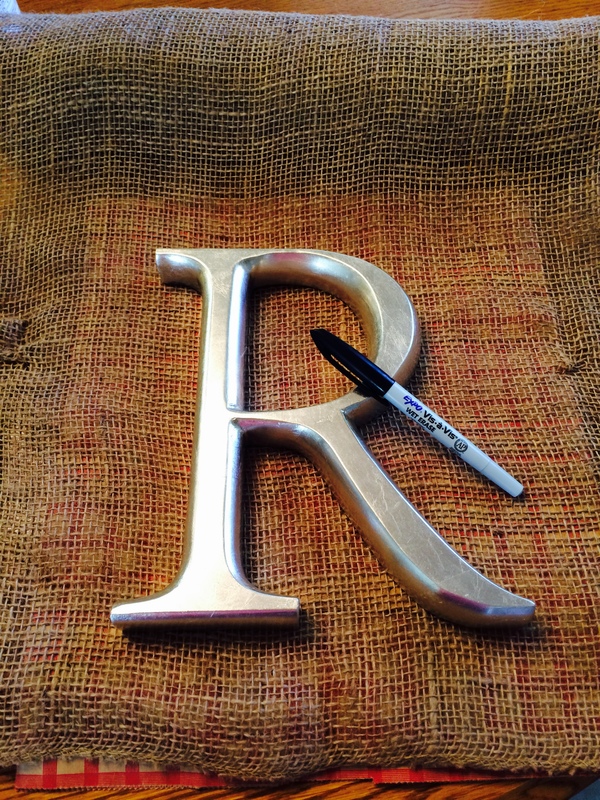 I traced an “R” that I had hanging in my living room with a water-based marker (water-based so that it would wash off easily if I got any on the R) and then I painted it with craft paint. 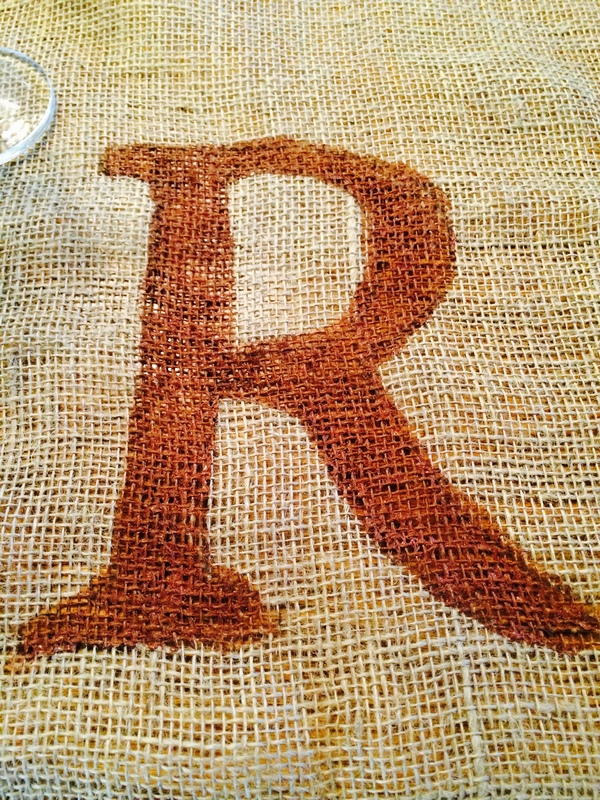 After I got the “R” painted on the end of my table runner, I repeated the same thing on the other end **I don’t plan on washing and reusing this, but if I did I would want to use fabric paint or mix a fabric medium with my craft paint. Lest you think I have the luxury of working alone, that little hand belongs to my four-year-old daughter! To keep the cost low, and to keep things from becoming too fussy, everything else on my table was already in my house. 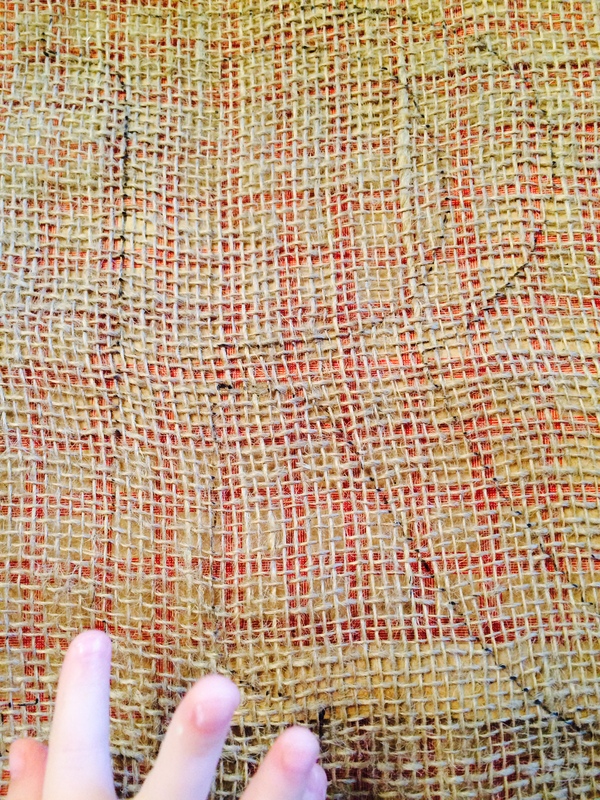 After placing the runner down, I chose a “mini quilt” made by my mom. It’s basically a finished quilt block and it matches my kitchen. On top of the mini quilt, I placed some blue canning jar lanterns that I made last summer for my patio. Ball Jar Company made some nostalgic canning jars in blue and green glass. I snapped some up and twisted some wire around the necks so they could hang and I put little battery votives inside. You could use real candles, but I have a 4-year-old, remember? After the lanterns, I scattered some colorful silk leaves and little tiny gourds that I had in my entryway and then I set the table. I placed my napkins right on top of the plates, and then the place card. My place card is also the menu. I searched for “Thanksgiving menu printable” on PInterest, and I chose the one I liked best. It was free and had a fillable form so I could enter in my own menu items without messing up the design. I just wrote names on the bottom with a brown marker. Here are some table-setting notes: If you’ve got nice china, use it. When else are you going to? If you’ve got kids, it’s a great opportunity for them to learn how to behave at a formal dinner and to learn the proper way to set the table: plate in the middle, knife next to plate on the right and spoon outside of knife. The blade should always face the inside so that nobody accidentally cuts themselves. The forks go on the left, salad (little) fork on the outside and dinner (big) fork closer to the plate. Water and wine glasses go right above the knife and a coffee cup goes to the right of the other glasses. There are a lot more pieces than what I have, so if you want to go even more formal, but aren’t sure what’s proper, just surf the web. 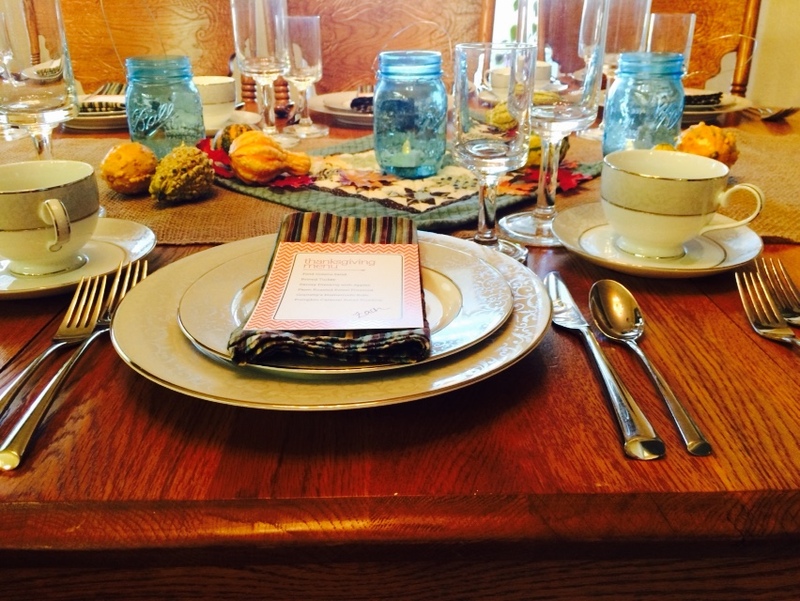 Here is a fun Thanksgiving Etiquette guide with table setting directions. Cranberries are typically not all that important in the grand picture of the Thanksgiving meal, but there was one Thanksgiving at my parents house when the cranberries got very dramatic. It was the first time I was bringing my husband (boyfriend at the time) to spend a holiday with my family. To say the least, my parents were not thrilled to have him that year. I wanted to him to feel welcome (which he did not) and so I was extremely insistent that we serve the cranberries the way his family did: left in the shape of the can and sliced. My family has never done well with canned cranberries, and we don’t do well with things being “just so.” We all prefer a homemade cranberry salad or cranberry sauce to the can, but if we do have to buy the canned because of a shortage of fresh cranberries in rural Oklahoma, we usually mash it up so that it looks more like a sauce than a jello-mold. My insistence that we serve the cranberry gel sliced in little circles seemed to confuse and frustrate my parents, which led to quite the argument between my mother and me… Now here we are, 9 years later. My husband and parents get along very well and we just celebrated our 8th wedding anniversary on Tuesday. The rest is just a fun anecdote! Rinse 1 cup quinoa with water, then bring 2 cups water to a boil. Add rinsed quinoa and return to boiling. Cover and reduce heat to low, continuing to cook until water is gone and quinoa is tender- about 12-15 minutes. Wash and remove stems from kale, chop it finely. Place 2 cups cranberries, 2 tbsp olive oil and 1 tsp honey in a food processor and pulse to coarsely chop ingredients. When quinoa has cooked, transfer to a mixing bowl. Mix in chopped kale. 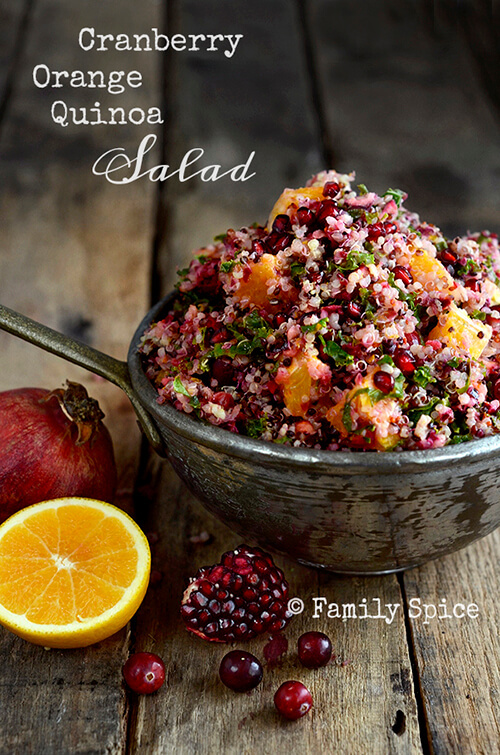 Allow to cool to room temperature, then add in orange zest, oranges, mixed nuts, pomegranate arils and fresh mint. Bring vinegar, sugar, onion, dried fruit, ginger, cloves, and cinnamon sticks to a simmer in a medium saucepan over medium-high heat. Cook, stirring until sugar dissolves, about 5 minutes. Add cranberries. Reduce heat to medium, and simmer gently until cranberries are tender and start to burst, 10 to 15 minutes. Transfer to a bowl, and let stand until cooled. Refrigerate until chilled if desired. Apples and Fresh Cranberries for garnish, optionalAdd equal parts of each juice to a pitcher, stir. Pour into glasses about 1/2 – 3/4 full. Top with soda. However you choose to serve your Thanksgiving cranberries, I hope that they are enjoyed by all, and I hope they are only as dramatic as you want them to be!